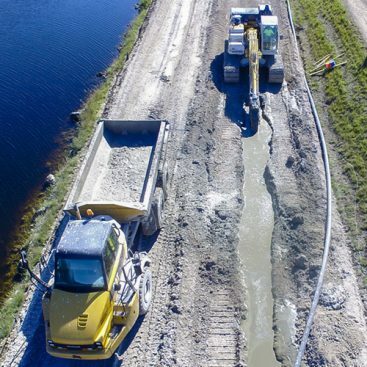 This project was performed for the Miami Conservancy District (MCD) under the direction of MWH Americas, Inc. (MWH) to mitigate seepage through the dam foundation and abutments. Lockington Dam was constructed approximately 90 years ago and was intended to control flooding and prevent a recurrence of the 1913 flood in Dayton, Ohio. Lockington Dam is of earthen construction, nearly 73 feet high and stretches a distance of 6,400 feet. It drains an area of roughly 255 square miles. It is one of 5 dams constructed by the district on the Miami River for flood control purposes. Drill, by Sonic Drilling methods, through the soft hydraulic core material and grout a PVC casing in place to protect the core during the remainder of the drilling/grouting process. 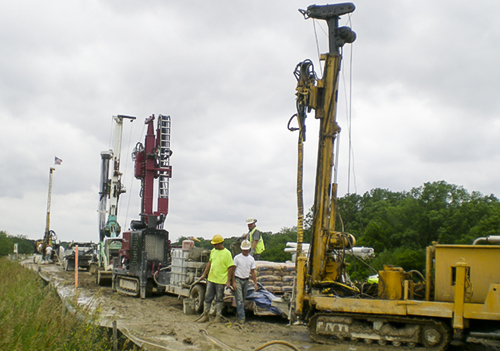 Advance steel casing, using casing advance methods, through the glacial outwash or till, to top of rock. 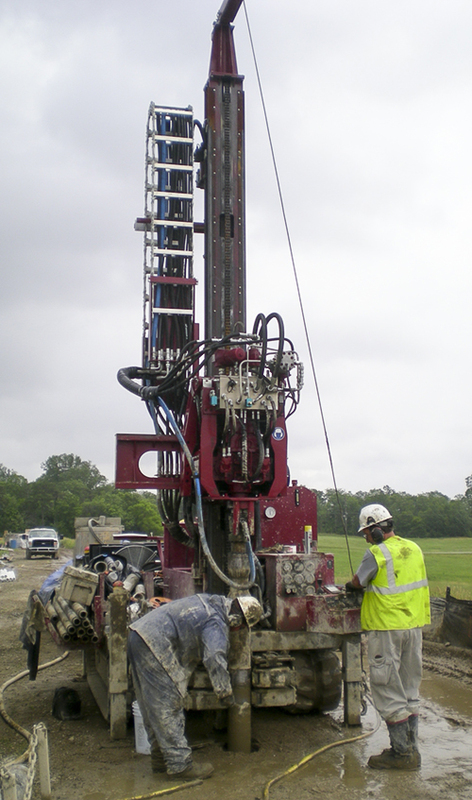 Drill underlying foundation rock by rotary destructive-drilling methods. Borings were installed vertically, up to 112-feet below ground surface, and were grouted in 10-foot (average) ascending stages. Grout passes through the header system prior to delivery to the target grout stage. Stages were isolated with a grout packer apparatus that consists of a single pneumatic packer attached to the bottom of an aluminum pipe string. Following rock grouting, the steel casing is extracted approximately 10-feet at a time and the exposed stages of glacial outwash or till are grouted under pressure by setting a grout packer in the steel casing. 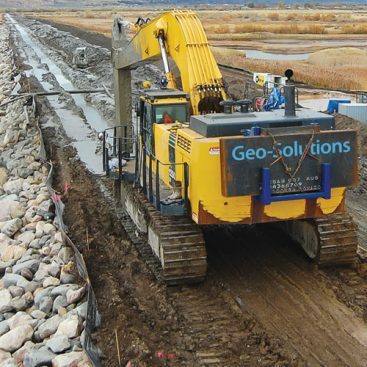 Geo-Solutions performed real-time grout parameter monitoring during all grouting activities. Geo-Solutions’ custom grout monitors, manufactured by RST and Geonor, are staged at the grout header/manifold and contain a magnetic flow meter and electronic pressure transducer interfaced with an on-board data logger. Information from the data logger is transmitted, via R/F radio signal, from the header to a central computer system, which displays, in real-time, the pressure and flow readings in graphical format. The system also records and logs the pressure/flow readings in a file archive. A suite of balanced, stable grouts were developed specifically for the project. Difficult or high-take stages were addressed by using higher unit-weight grout mixes containing Portland cement, bentonite, fly ash, and plasticizer. 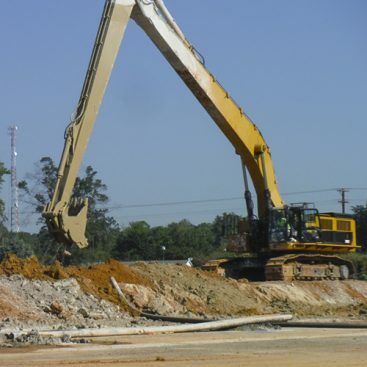 Protection of the hydraulic core was paramount for this project. Constant adjustments were made in grouting procedures to ensure no damage was done to the sensitive embankment component. With as many as 6 drill rigs and two grouting crews, along with the required ancillary equipment, simultaneously operating on the dam on a daily basis, limited access and spatial constraints, due to dam crest width, created unique challenges with task coordination and productivity. Diligent planning was required to keep this project running smoothly.